Fully-indexed record of each endpoint. 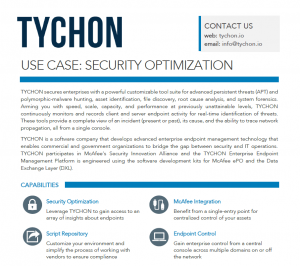 TYCHON secures enterprises with a powerful customizable tool suite for advanced persistent threats (APT) and polymorphic-malware hunting, asset identification, file discovery, root cause analysis, and system forensics. Arming you with speed, scale, capacity, and performance at previously unattainable levels, TYCHON continuously monitors and records client and server endpoint activity for real-time identification of threats. These tools provide a complete view of an incident (present or past), its cause, and the ability to trace network propagation, all from a single console. 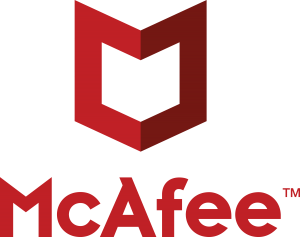 TYCHON works side-by-side with a multitude of McAfee products including DXL, ENS 10, TIE, ATD, and ESM. Having a single-entry point centralizes control of your assets and makes integration simple and efficient. The Rapid Query Script Repository allows for complete customization of your environment and simplifies the process of working with any of vendor to ensure 100% compliance. Gain enterprise control from a central console across multiple domains on or off the network. TYCHON allows instantaneous access to all systems using simple to use dashboards and question-based queries.